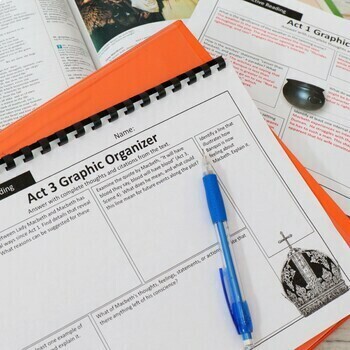 This Macbeth complete unit plan is designed to help you teach Macbeth from beginning to end with challenging, creative, and real-world activities. 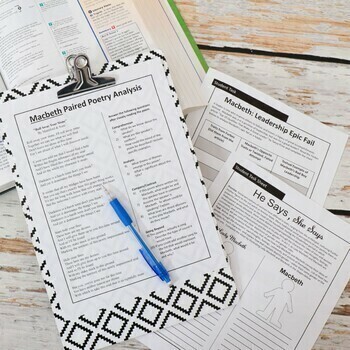 From paired poetry and nonfiction to creative art projects and writing prompts to differentiated note taking and comprehension exercises, you will be very pleased with what this classroom-tested, 4-5 week literature guide has to offer. You will love the quizzes and comprehension questions to make sure your students are reading and understanding. Your admin will love that it’s Common Core aligned and allows for differentiation. Student Experience: Student step into the world of murder and madness, witches and war, and lies and loyalty with these carefully crafted activities and lessons for Shakespeare's Macbeth that were years in development from my research and study of this play with my students. There is so much variety here. Kids love the task cards, creative projects, and connections the real world. They will be digging into the text and making connections with symbol/motif trackers, active reading questions, and videos linked right in with QR codes. All the way through the unit, the students will be thinking critically and making text-to-text, text-to-self, and text-to-world connections. - Plus: Almost all the file are editable and have answer keys! - Free updates for life! ♥ "Possibly the best purchase I have made on TPT. This has everything I need to teach Macbeth. I love the activities for each Act. A very thorough covering of the play that addresses student learning from every angle. Well worth the $$. Thank you!" ♥ "Great addition to the materials I had started with. Students enjoyed this unit better with more options and creativity." ♥ "What a huge variety of activities that require higher level thinking skills! Thank you for putting this together." 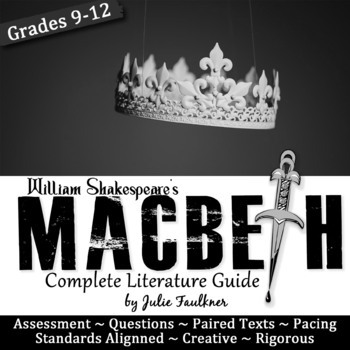 ♥ "I was so happy to find this AMAZING Macbeth unit in Julie's store. I love all of her work, and went directly to her store with fingers crossed that she had a Macbeth plan. This is comprehensive, with engaging activities and a clear plan. Her organizers are second to none. Love you, Julie!" ♥ "WORTH EVERY PENNY!!! Love the activities!!! Thanks so much!" ♥ "Faulkner, as always, has delivered a great collection of materials for the study of Macbeth. Materials are received in multiple formats, so you can print as-is or make edits to suit your classroom's needs." ♥ "This resource has everything I need to teach this unit. I can't wait to use these resources with my students. It's going to make teaching Macbeth so much easier!" ♥ "This is an extremely thorough unit. I like the different types of assessments. This is ideal for differentiating within my classroom. I like the integration of non-fiction and the poem." ♥ "Thank you so much! As a first year teacher I really appreciate all the resources you have included in this unit. My students will love the activities and I think I may actually convince them that Shakespeare is a cool guy, thanks to your resources. The great example you have provided in this unit will certainly help me when it comes time to create my own resources." 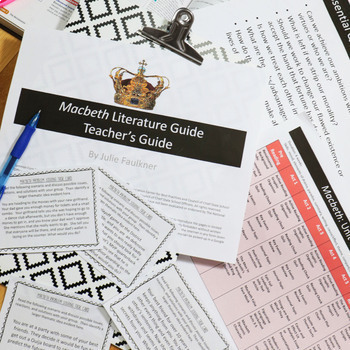 ♥ "I was so overwhelmed by where to begin with Macbeth - then I found this awesome resource! It made planning a breeze. I didn't end up using some things, and changed a few activities/questions to suite my classroom more, but it was great overall!" Interested in more of my literature units?